10.1 What Are Portable Fish Finders Particularly Suitable For? Portable fish finders can prove to be very useful, especially if you are going to fish from two or more kayaks or you just don't like to permanently mount your finder to a fixed watercraft. They utilize sound waves to locate fish and find the best fishing spots. They are a good investment for when you need to temporarily mount a unit on small boats, fish from the shore or go on trips. Our comprehensive guide on portable fish finders seeks to help you make a smart decision in regard to what model and style best suits your needs. The X-Cat Nacatin is a wireless fish finder that eliminates the need to drill into the hull of your boat. All you need to do is tie the sensor with a thread and cast it into the water. It turns on automatically when the switch terminals come into contact with the water. An LCD screen allows you to read information in low-light conditions. It displays critical data like fish size, battery status, water depth and temperature, bottom contours and more. There is a fish alarm that alerts when the device detects fish. This eliminates the need to watch the float for a long time while ensuring an instant catch. You don’t have to worry about the sensor being damaged by water because it is waterproof. One of the factors that make the Lucky FFW-718 invaluable is that it offers accurate readings. It comes with a wireless sensor that has a depth range of 135 feet and an operational range of 394 feet. The screen displays critical information like bottom contour, fish depth, water depth and temperature, battery status and more. It is a high contrast LCD screen with backlight that is clearly visible in daylight and darkness. This unit supports three languages and gives you the freedom to adjust sonar sensitivity settings, chart speed, depth range setting and sensitivity level setting. There are two alarms, one for detecting fish and alerting you when there is a high chance of a successful catch. The second alarm signals the depth preset by the user. 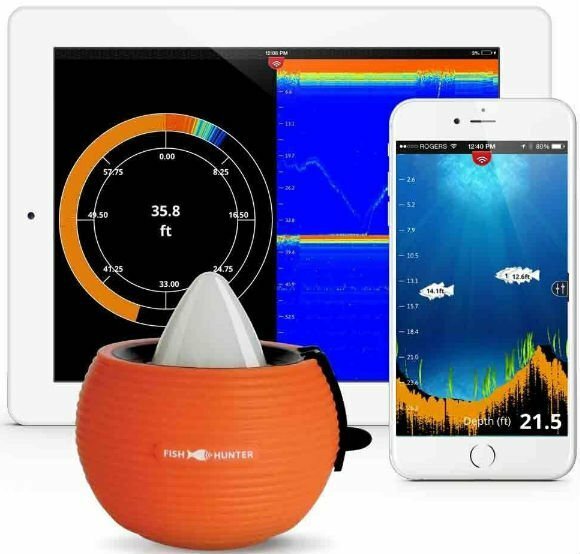 The Deeper Smart Sonar Pro is compatible with mobile devices running on Android 4.0 or later and iOS 8.0 or later. The castable unit sends sonar data to your mobile device and a downloadable app offers additional features like Weather Forecast, Solunar Forecast Calendar, Fish Notes etc. The device operates on an independent wireless connection and can be used in places without cell reception. It offers a greater connection range than other models (330 feet). At only 3.5 ounces, the Sonar Pro is incredibly portable and you can take it anywhere with you. The ABS construction ensures tough and impact resistant performance. It operates on a dual beam sensor and provides a detailed look in a 15-degree cone. The maximum depth range of this finder is 260 feet in freshwater and the lithium polymer battery supports 6 hours of continuous use. The Venterior Portable Fish Finder uses a sonar transmitter that turns on automatically when casting into the water. It has a color TFT LCD screen that conveys information regarding the water depth, bottom contour, fish icon, depth range, power indicator, simulation mode and depth scale. There are two holes in the wireless sensor for tethering to the boat. This unit has the ability to remember the last setting and you can change depth and temperature units. Next on our list is the Sodial® FF-001 Portable Fish Finder, a unit that offers incredible value for your money. It comes with a 200 kHz frequency sonar that relays detailed information to the screen. Users have the freedom to choose between meters and feet when it comes to the measurement units. This unit can float on water or be installed on the side of a vessel. It uses a wide temperature anti-UV LCD screen with white backlight for improved visibility in low-light conditions. The 0.6-73 meters depth range with 0.1 meters accuracy is quite decent given the affordable price of the unit. The IShowStore Portable Fish Finder uses a sonar with a 45-degree beam angle. It delivers detailed information to an LCD backlit screen. The sonar scans anything within a depth of 100 meters, giving you accurate information in regard to water depth and temperature as well as fish location. This unit also comes with a round transducer sensor that has 25 feet cable and a removable transducer float. Other notable features offered include a fish depth indicator and a fish alarm that alerts you when there is a high chance of a successful catch. This portable fish finder from Best Xinlong boasts a large adjustable dot matrix LCD screen with backlight. It uses a wireless sensor that can be mounted on fishing rods. The sensor works within a 50-meter range and delivers accurate information to the screen in regard to water depth, water temperature, bottom contour, fish depth, fish location and more. The unit is suitable for use in both freshwater and saltwater as a fish finder or depth sounder. It has built-in memory for storing sonar settings and its fully waterproof design offers added protection from water. This unit comes with a dot matrix LCD display that displays critical information like fish depth and location as well as water depth and temperature. It scans anything within a depth of 120 feet and boasts a wireless operating range of 180 meters. The 125 kHz frequency sonar has a beam angle of 90 degrees and can operate within a wide temperature range of 20 to 70 degrees Celsius. The mainframe of this unit is powered by a 3.7-volt lithium battery while the transducer uses a 3.7 polymer battery. The Docooler Portable 3.5” LCD Fish Finder is designed for both beginners and pro anglers. It has a reasonably spacious display that is visible in daylight and at night. It can scan to a maximum depth of 984 feet with 1/10th precision. This means access to important information like water temperature, bottom contour, and location of fish. The unit offers 100 levels of sensitivity settings, multi-level depth range, quick manual zoom, and auto zoom bottom tracking. The audible fish and depth alarm works within a depth of 99 feet. Also included are a dual frequency sonar and a maximum power output of 800 watts. The FishHunter Pro Portable Fish Finder boasts a depth range of 150 feet and only needs to be placed 4 feet of water to work. It is compatible with iOS and Android mobile devices, connecting via Bluetooth or WiFi. It has a connection range of up to 150 feet and the included Tri Frequency sonar is the closest you can get to a Chirp sonar. The unit is powered by a Pro battery that offers 10-hours worth of continuous use before requiring another charge. You can view the feedback in either RAW or FISH View, with the former giving the highest detail. What Are Portable Fish Finders Particularly Suitable For? A portable fish finder is something you may have to look into if you are on a kayak, boat rental or small boat. You will certainly have a shortage of space if fishing on a kayak. 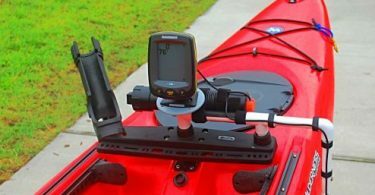 All of the equipment will already be weighing down the kayak and any extra weight, however small, will make it more difficult to paddle. You will be forced to work harder and as such, you'll be more tired at the end of the day. A portable fish finder is a compact and lightweight and will allow you to enjoy your fishing trip without adding too much weight to your gear. You will want to have a portable fish finder if you intend to rent a boat. The last thing you should do is permanently install a finder on a boat that you don’t own. It will just be a waste of your money. They suffer from the same issue as kayaks. While you won’t notice the difference as much when you add an engine and a few people, a portable fish finder can still prove advantageous on a small boat. There are three main types of portable fish finders i.e. mountable, portable and castable units. Portable units are the traditional style of portable fish finders and usually include a nylon carry case that holds all of the components i.e. portable transducer, small rechargeable 12V battery, small fish finder and a plastic mounting base. These units are good for ice fishing and open water fishing and work best when used in small boats or kayaks. Mountable fish finders can be temporarily mounted to the transom or side of a boat. They are the only type of portable fish finders that can be used with a float tube. Castable units are the new generation of fish finders. They feature a small floating transducer and communicate with an app on your smartphone via Bluetooth. Castable fish finders are best for bank fishing, but can also be adapted to boat or kayak use. Now that you know when to use a portable fish finder and the different types available, it is time to explore other criteria for choosing a model that best suits your fishing needs. There are plenty of features to look for choosing a fish finder. But when it comes to portable units, below are the special things to think about. One of the most important things is to make sure that your portable fish finder is easy to attach and detach without major damage to the boat. There won’t be a way to permanently install the finder on a kayak, and this can prove a problem for some anglers. There are some quick release options you can purchase, but that’s not the limit of your choices. Plenty of companies have found easier ways to detach portable finders. Greater wattage offers clear and deeper readings more quickly. Go for a unit with the highest power you can afford, especially if you plan on fishing in deep waters. A minimum of 50 kHz for 100 watts of power will scan depths of up to 400 feet. Dual sonar systems allow you to see near and far areas at varying detail levels. Higher frequencies provide more detailed information and are good for deep water fishing. In addition to frequency, you'll also need to look at the angle of the sonar. There are options up to 120 degrees that give you a wide field of view. Make your decision depending on how deep the water you are fishing in. Regardless of what your needs are, the 10 portable fish finders reviewed above are the best you will find. They are easily the most interesting gadgets for anglers, and their ease of use is something you won’t get with traditional fish finders. There are plenty of options out there and we hope you now have a better understanding of them to make the right choice.